Serra Cafema Camp is one of the most remote camps in all of Southern Africa and offers one of the most memorable experiences in Namibia. Inspired by the pioneering spirit of the area and the remote explorer aesthetic, Serra Cafema is an unexpected oasis of luxury and sumptuous spaciousness perched on the Kunene River which forms Namibia's northernmost border. Situated under big shady Albida trees overlooking the Kunene River the camp comprises 8 raised canvas and thatch chalets (one a 200m2 family unit) complete with en-suite bathroom, retractable glass facade with abundant outdoor lounging, dining and shower decks. The sounds of the rapids just downstream from camp contrast starkly with the views of the sand dunes of one of the driest deserts on Earth. The Ozonganda, or public homestead area, comprises indoor and outdoor dining areas, sunken lounge, river bar, library, shop and swimming pool. Perched on the cool waters of the Kunene River, this area is a celebration of Himba style. Serra Cafema shares this region with the wonderful and colourful Himba people who are some of the last true nomadic people of Africa. The Kunene River is the only permanent source of water and creates an oasis along its banks surrounded by rugged mountains and sand dunes. 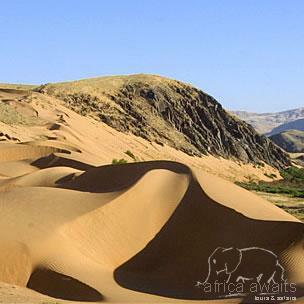 Activities include enjoying the breathtaking landscape scenes with springbok, ostrich and gemsbok (oryx) dotted here and there, traversing the sand dunes in 4x4 Land Rovers and boating on the Kunene River where one can watch for the Kunene crocodiles. Walking in the remote mountain and river valleys is also a highlight. Serra Cafema is often visited by the native Ovahimba families who live in the nearby vicinity, which gives guests the opportunity to learn about their lifestyle and traditions. 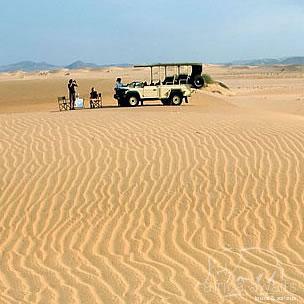 One of the highlights of Serra Cafema is the carefully guided quad-bike excursions that tread lightly on the dunes, while allowing guests to experience a true desert. 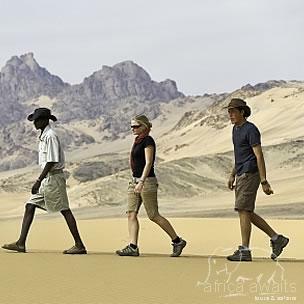 With your holiday, safari or business trip from in to Serra Cafema Camp in Namibia.